For many people, “skin care” brings to mind eye crèmes, masques, wrinkle-reducers, and facial cleansers and toners—all of which is well and good. But in case you haven’t noticed (and we know you have!) your face isn’t the only part of you that’s covered in skin! At IMAGE, we strive to keep every inch of your skin beautiful, healthy and vibrant. That’s why we have such an extensive line of body skincare products. Lightening: Fresh, Bright Skin—All Over! The skin on your hands and body can suffer from the same irregularities in complexion that your face does—but the skin on your hands and body is different from the skin on your face. It has its own needs. Our intense lightening body lotion and hand crème are the perfect way to rejuvenate your complexion from head to toe! Teens struggling with getting clear skin for the school dance might be the “face” of acne, but outside of Hollywood, we know better. Acne can strike anyone at any age, and it definitely doesn’t have to be confined to your face. 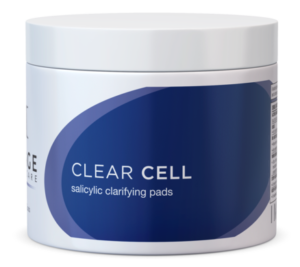 That’s why our CLEAR CELL salicylic clarifying pads can be used on your face as well as your body to cleanse your skin of excess oil and reduce the inflammation that acne brings with it. They gently exfoliate and are great for both daily cleansing and for freshening up after working out. Whether it’s your chest, your thighs, your back or your face—or just about anywhere else—we’re here to help you beat acne. Exfoliation is a great weapon against acne, wherever it strikes, but it’s also just good skin care, period! Our BODY SPA exfoliating body scrub is perfect for polishing your way to smooth, beautiful, younger looking skin. AHA, fruit enzymes and naturally sourced walnut shells work together to reveal your most beautiful skin (and keep its pH balance perfect!). That’s only the tip of the IMAGE iceberg when it comes to beautifying your body’s skin, though—be sure to check out our entire selection of body beautiful skincare products!